These ancient fish lack teeth, and instead of scales, have bony plates called scutes. They have a limited habitat, living in the Gulf of Mexico most of the time, and then swim up rivers to spawn. For years they were so overly fished that they now are listed as protected, and are illegal to catch or kill. Unfortuantely they are recently famous for leaping out of the water and injuring boaters. Common names for this sturgeon are few due to the very limited distribution range. These include the gulf sturgeon and the Gulf of Mexico sturgeon. At the turn of the 1900s, sturgeons in North American waters were heavily fished for their flesh and caviar. The gulf sturgeon was fished off Florida from 1887-1985 with a peak harvest at the turn of the 20th century. This was followed by declines in harvest until the fisheries were closed in 1986. 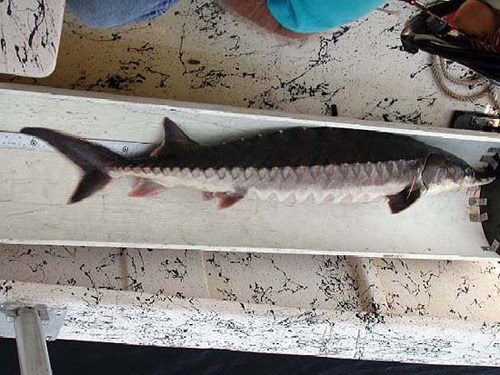 Although not intentionally dangerous to humans, the gulf sturgeon has developed quite the reputation as being a “flying” fish in the Suwannee River in Florida. There are incidents of the gulf sturgeon leaping out of the water and injuring boaters. Due to its large size and heavy body armor, injuries have included knocking people unconscious, fractured spine, collapsed lung, ruptured spleen, broken ribs and facial wounds requiring plastic surgery. One victim lost four fingers of which three were reattached and two men suffered injuries when they steered their boat into a bridge while attempting to avoid a leaping gulf sturgeon. 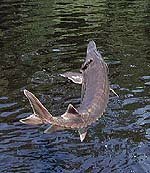 The Florida Fish and Wildlife Conservation Commission has launched a campaign warning people about the dangers of leaping gulf sturgeon in the Suwannee River as well as educating them about the biology and behaviors of this ancient fish. In addition to commercial and recreational harvest, habitat destruction and degradation are also responsible for the decline of the gulf sturgeon. Dams have prevented access to sturgeon migration routes into the headwaters of rivers where they spawn. 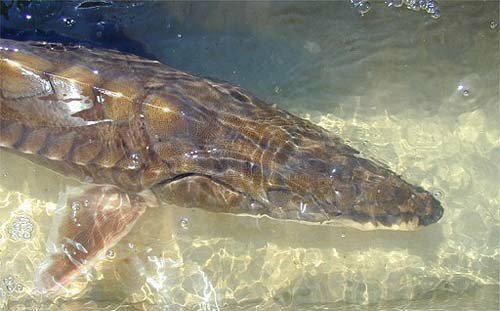 Dredging and decrease of groundwater flows as well as recent droughts may have also contributed to the decline of suitable gulf sturgeon habitat. 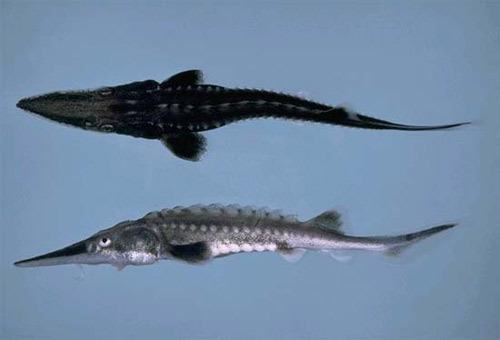 Contaminants originating from agriculture and industry may cause reproductive failure, reduced survival of the young, and/or physiological alterations in the gulf sturgeon. 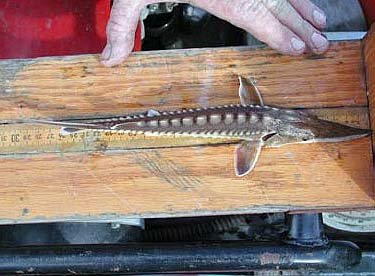 The federally mandated “Recovery and Management Plan for the Gulf Sturgeon” includes prevention of further reductions in wild populations, establishment of populations to allow the delisting of this species, and establishment of self-sustaining populations that can withstand directed fishing pressure within each river system. Other goals include protection and restoration of essential habitat, study details of life history, and to reduce or eliminate incidental mortality. In 2002, the US Fish and Wildlife Service and National Marine Fisheries Service officially designated “critical habitat” for the gulf sturgeon consisting of 2,738 river kilometers and 6,042 square kilometers of estuarine and marine habitat. The state of Florida has also prepared a “Conservation Plan for Gulf Sturgeon“. It is hoped that the decline of gulf sturgeon populations will be brought to an end, and that populations will eventually reach sustainable levels. The gulf sturgeon is restricted to the Gulf of Mexico from Tampa Bay, Florida to Lake Ponchartrain, Louisiana. Its range also includes the drainages of the Gulf of Mexico from the Mississippi River to the Suwannee River in Florida. 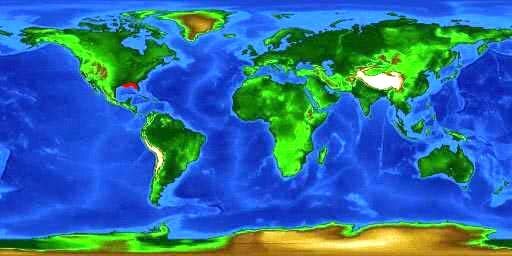 It also occurs sporadically as far west as Texas and in waters of Florida from Tampa Bay south to Florida Bay. However, historical data indicate a reduction in populations of the gulf sturgeon. The gulf sturgeon is anadromous meaning that its lives in marine waters during most of its life migrating to tannin-stained freshwater rivers to spawn. During its residence in marine waters, it lives in the shallow seagrass beds and muddy and sandy bottoms of the continental shelf. Adult gulf sturgeon spend over 7 months in rivers, returning to estuarine or gulf waters during the coolest months of the year. Subadult fish also participate in this migration. 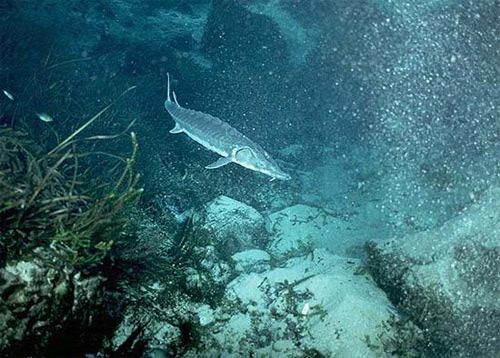 During the warm summer months, gulf sturgeon congregate in the deeper sandy and rocky bottom areas of rivers as well as near the mouths of springs. Mature gulf sturgeon spawn in close proximity to the headwaters of rivers, spending the summer in mid- and lower-reaches of these rivers. This ancient fish appeared in the fossil record approximately 225 million years ago and evolved in roughly the same time as sharks to their current form. The backbone is cartilaginous (similar to sharks) as are the five rows of external scutes that protect the head and top portion of the body. The body of the gulf sturgeon is sub-cylindrical; the head consists of an extended snout with four tactile barbels on the chin in front of the mouth. These barbels are used to sense prey. The vacuum-like mouth lacks teeth and is protractile on the lower surface of the head. The caudal fin is asymmetrical with the upper lobe being longer than the bottom lobe. The gulf sturgeon can be distinguished from the lake sturgeon, A. fulvescens, by its narrower mouth and paired postdorsal and preanal scutes (the lake sturgeon has only one row). It is quite difficult to visually distinguish the gulf sturgeon from the Atlantic sturgeon (A. oxyrinchus). Gulf sturgeon are typically light brown to dark brown in color, fading to a lighter cream or white ventral surface. The mouth of the gulf sturgeon lacks teeth. It feeds like a vacuum, sucking in its prey including shrimp, polychaete worms, and other small organisms. Scutes are modified scales and form a protective armor on the head and body. These are cartilaginous and protect the gulf sturgeon from predation. Gulf sturgeon can grow up to 8 feet (2.4 m) in length and weigh 200 pounds (90.7 kg). Females reach sexual maturity anywhere from 8-17 years in age while males become mature from 7-12 years of age. The average size of the gulf sturgeon is 5-6 feet (1.5-1.8 m) in length. During the time the gulf sturgeon are living in freshwater rives, they undergo weight loss as they forego eating at this time. However, they experience substantial weight gain once they enter the Gulf of Mexico during the winter months when they commence feeding activities. The lifespan of this unique fish is at least 25-30 years. Prey items of the gulf sturgeon include bony fishes and benthic invertebrates such as amphipods, isopods, crabs, shrimp, polychaete worms, and aquatic insect larvae. Juveniles living close to the mouth of the Suwannee River feed primarily on amphipods, isopods annelids, dipterans, lancelets, brachipods, and plant material. Adult sturgeon only feed during their residence in the estuarine and marine waters of the Gulf of Mexico, saving their energy for reproductive pursuits. 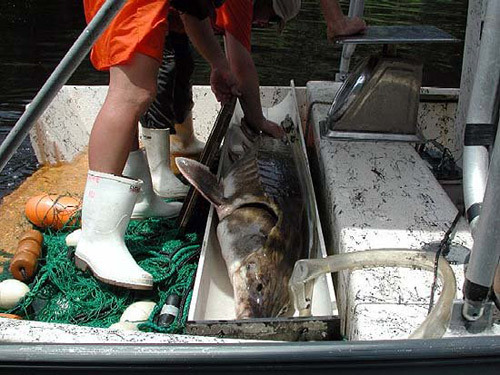 Reproductive activities of the gulf sturgeon are not well studied. 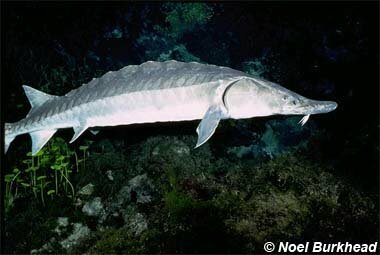 Spawning occurs in freshwater rivers that sturgeon migrate into during the spring and summer months. Some research suggests that spawning takes place close to springs over rocky substrates. Gulf sturgeon appear to be homestream spawners, in other words, they return to the rivers where they were born to carry out their own reproductive efforts. There is little if any repopulation from migrants originating from other rivers. In freshwater habitats, gulf sturgeon have very limited predators due to their size and armor-like scutes that protect this fish from harm. Alligators may feed on sturgeon in rivers such as the Suwannee River in Florida. In the Gulf of Mexico, large piscivorous fish including sharks may be potential predators. Although little is known regarding the parasites of the gulf sturgeon, it is thought that these fish leap out of water perhaps to rid themselves of parasites. This has yet to be determined.